62 total news articles in this section, 10 per page. Thanks to Canadian Transformers site Cybertron.ca and a number of it's members for pointing out that both Electrostatic Soundwave and Freeway Jazz have been released in most brick and mortar store across Ontario. This is good news for Canadians as this is just one less step to get new molds on the shelves. Looks like Canada is catching up in the rat race that is Transformers: Revenge of the Fallen. Today Seibertron.com member and easily the most attractive News Mod anywhere on the internet Down_Shift found both ROTF Voyagers Long Haul and Grindor at a Walmart in Mississauga, Ontario. What makes this sighting even more special than it already is, is that even though Canada does not traditionally have a "Black Friday" like the good ol' USA, Walmarts in Canada are doing a two day "Big Deal" this weekend on a number of select items. One of these items... you guessed it, all Voyager Class Transformers. 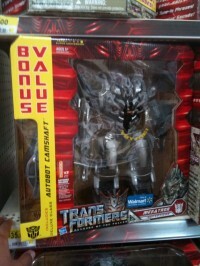 Usually ROTF Voyager figures would be $30.00 but with the two day sale, these newly released bad boys are only $15.00! And that's in Canadian funny money! Our first official sightings of Transformers: Revenge of the Fallen N.E.S.T. Global Alliance figures are in! Wave 7 Deluxe figures Alliance Bumblebee, Tuner Mudflap, Armorhide and Dirge have been spotted at retail in The Philippines. This means that other figures and waves are around the corner such as Bludgeon from the Voyager class line and Breakdown from the Scout class line. Maybe you've found these bad boys? Why not share it with the world in our Transformers Toy Sightings Section! Excellent news for Animated fans and toy collectors. 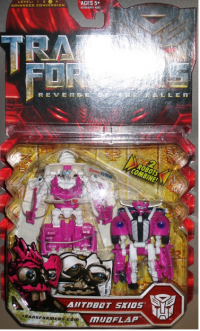 Sixshot of TFW2005 has been the first to spot Animated Deluxe Wave 7 at retail. The much anticipated wave containing Freeway Jazz and Electrostatic Soundwave was found at a Wal*Mart in Tuscon, Arizona. Wave 7 was set for release in the latter end of 2010, and it looks like it's slowly being pushed out into the market. Check out the picture below for proof! We don't suggest you rush to your closest Wal*Mart immediately, however if you do sight the two figures, remember to post it in Jazz's and Soundwave's respective sighting pages. Keep it here at Seibertron.com, your Ultimate Transformers Resource! Robot Heroes Stocking Stuffer 3-Pack! 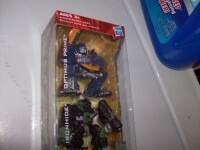 Forum Member Razorclaw0000 finds an interesting Christmas themed Transformer product at a local Target, the Robot Heroes Stocking Stuffer 3-pack. Yes, the holidays are approaching, and this gift comes with three unchanged Revenge of the Fallen Robot Heroes, Optimus Prime, Ironhide and Starscream. Stay tuned to Seibertron.com for your latest Transformers news and updates! The street date for the Wal*Mart Exclusive Masterpiece Skywarp in the United States was November 1st. We are a couple days past that, and we have what seems to be the first sighting of the figure within the country. Thanks to Hicks_Royel of TFW2005, who spotted and purchased the figure at a Kentucky Wal*Mart. Skywarp goes for the decent price of $60 US. This doesn't seem to be an isolated incident, so check your local Wal*Marts Seibertronians! For our international members, Masterpiece Skywarp has already been released in Canada and the United Kingdom. If you're unsure about the future purchase of the figure, check out forum member kirbenvost's pictorial of the Skywarp here. You can check out the original thread here. If you happen to find Skywarp at your local Wal*Mart, remember to fill out Skywarp's sighting page to help out fellow members and fans. Stay tuned to Seibertron.com for the fastest Transformers news on the net! TRU Exclusive "Back Road Brawl" Coming to UK! 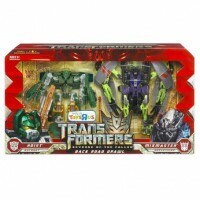 Seibertron.com member Pretender Skywarp has found on ToysRus UK's website the listing for the upcoming ToysRus exclusive Back Road Brawl gift set. The set consists of two Generation 1 homage repaints, Hoist based of the 07 Movie deluxe Longarm mold and Mixmaster based of the ROTF Voyager Mixmaster mold. To see the listing just click here. Seibertron.com member infinitimagnus has informed us that the previously reported Walmart Exclusive Transformers Revenge of the Fallen Leader Class bonus packs of Optimus Prime and Megatron with Autobot Camshaft have been spotted at retail in Orlando, Florida. Have you spotted these or any new Transformers in your area? Please let us know by reporting it in your Sightings Threads. ROTF Skidz And Mudflap Deluxe Two-Pack Variant? From an independent Malaysian toy store, TF community member Ghoyle snapped pictures of a packaging variant with deluxe ROTF Mudflap and Skids in their ice cream truck disguise. Is this a new variant for the MISB and variant collectors to have to track down? If this becomes a more common sighting, we'll be sure to share with you. For now it seems to be an isolated incident, but was mentioned to be on the shelf with deluxe Waves 3 and 4. Seibertron.com for all of your Transformers news and resource needs. Target.com now shows the Straightaway Shootout Legends 5 pack, which we first reported on here as being in stock. As a reminder, this is a Target exclusive which consists of the following figures. Mudflap - Transformers ROTF Legends Mudflap without changes. This set will retial for $19.99 both in stores and online. To view Target.com's direct page link where you can order your set you may click here! Seibertron.com - The Ultimate Transformers Resource! 4,526 pages were recently viewed by 1,061 unique visitors. This page was viewed 1 times on Friday, April 19th 2019 3:50pm CDT. © 2019 Seibertron, Inc. DBA Seibertron.com. All Rights Reserved. Established June 2000. Seibertron.com is owned by Ryan Yzquierdo.